They’ve reached a new low! 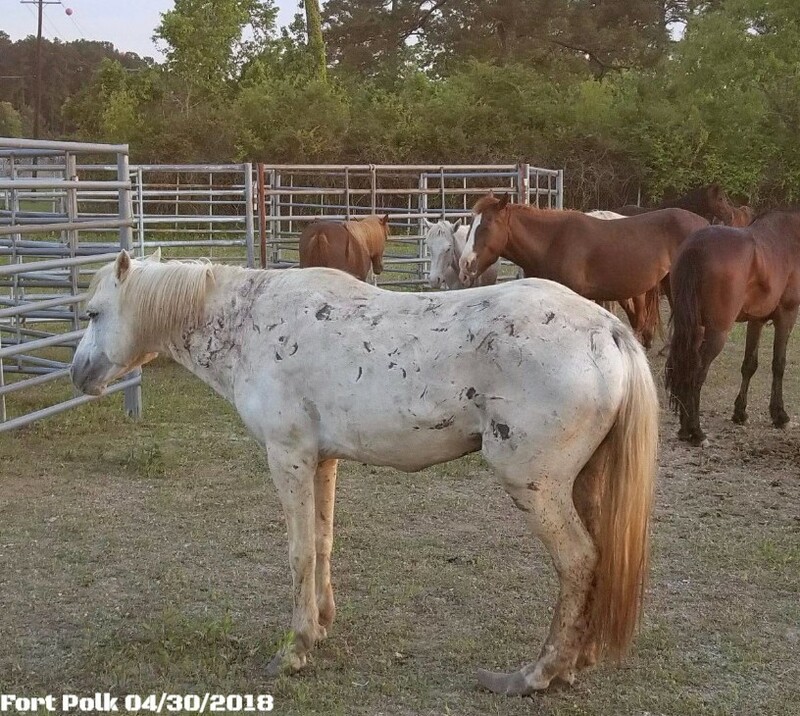 Despite ongoing litigation the US Army – Civilian led Environmental Division / Range Control at Fort Polk again has decided to proceed with unethical capture of horses using damaging capture methods. 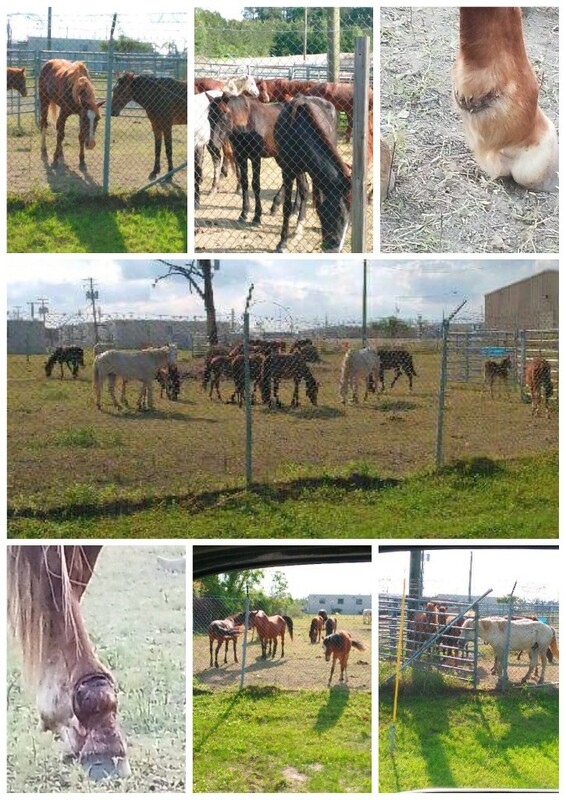 As of 4/30/18 it is reported that approx 37 Horses are in the North Fort holding pen. The pen is approximately 150ft x 150ft and is holding studs, mares and babies all together. Majority of the horses are injured. Initially 9 horses were seen late last week and over night the count grew to 37 so these horses are likely to be in holding at another location before being brought to the holding pen located on North Fort Polk. Pegasus’s witnesses and experts, including Dr. Brendan Batt, Dr. Tom King, Stacey Alleman McKnight, and Dr. Bruce Nock, as well as other local organizations have explicitly expressed that they are available to the Army for consultation and would love to help. The Army should also consult with Dr. Sponenberg (Amicus) and the Livestock Conservancy, as well as national groups like HSUS, state groups like COLAA, and organizations with wild horse experience including American Wild Horse Campaign. The only way to find the best solutions is to engage in honest and open consultation with as many experienced people, experts, and local stakeholders. It is extremely unfortunate that the Army has chosen to ignore help and proceed with cruel and inhumane capture methods. The horses are in immediate danger and urgently need veterinary care due to injuries sustained during unethical and inhumane capture. Under Louisiana Criminal Law Statue § 14:102.1 it is a Crime to withhold veterinary care once the horses have been remanded into their custody. (i) Mistreats any living animal by any act or omission whereby unnecessary or unjustifiable physical pain, suffering or death is caused to or permitted upon the animal. (3) For purposes of this Subsection, if more than one animal is subject to an act of cruel treatment by an offender, each act shall constitute a separate offense. Contact Key Decision Makers and implore them to allow an INDEPENDENT veterinarian to address the welfare of these horses. The grey stallion appears to have a hernia on his belly and a terribly overgrown left hind hoof. Was he in this condition in the wild or did he get that way in captivity? If in the wild, I understand rescuing him on the basis of his problems, but there is absolutely no excuse to put him in a pen with other stallions where he’s bound to get hurt even more. If he got that way in captivity, shame on those who’ve neglected to care for him properly. It’s already unacceptable as it is that these horses have been injured as a result of faulty planning. If Fort Polk’s Range Control division refuses to seek assistance in capturing and managing these horse properly, they need to be held accountable. The purpose of the military is not to kill people and break things. While sometimes it must break, it must always guard. the MILITARY’S PURPOSE IS TO SERVE AND PROTECT AMERICA. Major Matt Cavanaugh, a U.S. Army Strategist, has served in assignments from Iraq to the Pentagon and New York to New Zealand. What and WHERE are we as a country unless we preserve and protect our heritage? but rather we belong to it. forever changed as a result of their displacement from the land they formerly occupied in preparation for the construction of Camp Polk. to sustain this nation as one nation, under God, and indivisible. To the community in whose arms we entrust our families’ security, enrichment, and well-being, and for providing the human capital to embrace, construct, and sustain a partnership that includes the Joint Readiness Training Center and Fort Polk. These Wild Horses are an important part of Louisiana’s history and as such should be preserved and protected. The National Historic Preservation Act of 1966 was passed primarily to acknowledge the importance of protecting our nation’s heritage from rampant federal development. It was the triumph of more than a century of struggle by a grassroots movement of committed preservationists. Is there any proof these are or were shod horses? Surely this would be public as part of the effort to eradicate them, if true. Easy to say, hard to prove.